Bats spread the Ebola virus to humans and play a pivotal role in disease outbreaks, evidence suggests. Ebola, a filovirus, causes fever, vomiting, diarrhoea and sometimes bleeding. There is no treatment or vaccine and 25–90 per cent of infected people die. The virus is transmitted by direct contact with infected blood, body fluids and tissues. The new findings have emerged from data collected in the remote Kasai-Occidental and Kasai provinces of the Democratic Republic of Congo (DRC) which experienced a large Ebola outbreak in 2007 in which 186 people died. Some members of the research team helped discover in 2005 that fruit bats are a natural reservoir of the Ebola virus. For the new study, researchers led by Eric Leroy from the International Centre for Medical Research in Franceville, Gabon, interviewed locals about the background of the Ebola cases. They were told that the annual migration of the fruit bat Hypsignathus monstrosus was particularly large in 2007. Bats are an important source of protein in the area as wild animals are in short supply. They are often shot and then sold covered in blood. 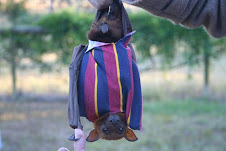 The researchers believe the source of the 2007 outbreak was a man who bought bats at market. He survived, experiencing only a low fever, but his four-year-old daughter died after developing a sudden fever accompanied by vomiting. A family friend who prepared the girl’s body for burial was subsequently infected and went on to infect 11 members of her family, all of whom died. Researchers say their study suggests infection is only transmitted after prolonged contact with an infected person, meaning it may be easier to contain an outbreak than was previously believed. "Sometimes bleeding"? That's basically all ebola is, intense hemorraging!